"I have found the technique helps with almost every client I have! I know I would not have been as successful in helping people without the method you have taught me." "I would like to thank Brigitte for a Wonderful weekend. Learning the Dorn Method was a Fantastic experience, as a client I found the treatment very effective and liked how powerful it was for something so gentle. As a Therapist I am really excited about Introducing the Dorn Method to my clients as i'm sure it will be life changing for so many of them. The simple self-help techniques complete the Dorn package perfectly to ensure that the effects of the treatment will be long term. I went on the workshop after my Friend had highly recommended it and i'm really glad I did!" Come and join this wonderful and exciting revolution in Back care. The Dorn Method is easy to learn, safe, gentle and a very valuable skill that will last you a lifetime. Personally I get fantastic results all the time with recommendation after recommendation. It feels great to be able to help people with their pain, that's the real joy. My quality, intensive Dorn Method workshops are designed for Complementary Therapists or indeed anyone who would like to learn how to take better care of their own back and joints. If you're a Complementary Therapist there's nothing better than adding the Dorn Method to the range of therapies you can offer your clients, and you can also gain valuable FHT CPD points for attending the workshop. If you'd like to come onto one of these workshops, please book using the 'Book Now' buttons and you'll receive an email within 24 hours to confirm your booking. This is a quality two-day intensive workshop accredited by the FHT and designed for Therapists who wish to integrate Dorn into their practices. 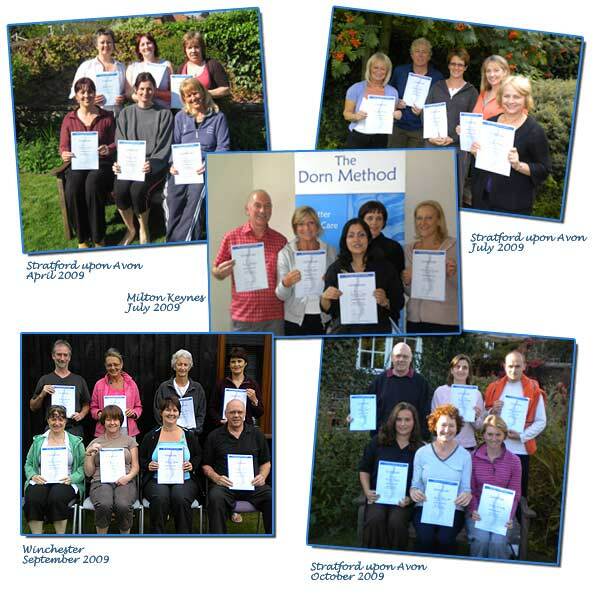 If desired it can be followed up with an Advanced Workshop and additional Practice Days leading to membership of the Dorn Method Therapists Association (dmta.org.uk). The Workshop course fee is £295.00 with a £100 non-refundable deposit payable in advance to confirm your booking and secure your place (the remainder is payable two weeks prior to the workshop. Included with the course is a Dorn Method certificate from an Authorised Dorn Method Instructor (which you'll need for insurance purposes) and comprehensive manual. 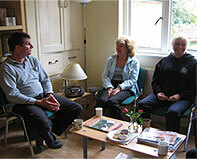 The Advanced workshops are for existing Dorn Method students only, i.e. those who have been on my previous workshops. The course is run on a single day and costs £145 with a £75 non-refundable desposit requirement to confirm your booking. 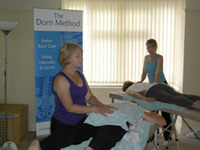 This is an Intensive Two Day Dorn Method Seminar, where you'll be getting plenty of hands-on experience learning the fundamentals of the Dorn Method techniques, focus will be more towards the practical elements of Dorn techniques. 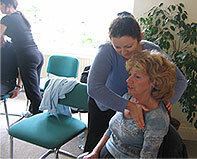 The workshop also includes the Breuss Massage which is a complementary aspect to Dorn Method therapy. After the initial 2 day workshop ongoing Practice days/Refresher days and Advanced workshops are offered for those wishing to take Dorn further. In order to gain a Competency Certificate, again for those who wish to develop their skills further, students will be expected to attend a Practice day and also complete a number of case studies. You'll be taught in small groups so there will be plenty of hands-on as well as theory. The workshop will give you a very good grounding in the Dorn Method, and upon completion of the two day seminar, you will receive a completion certificate. This course is open to anyone interested in the Dorn Method, you don’t have to be a therapist to take part. However, if you wish to gain CPD points (and relevant insurance) from the FHT you will need to have a Level 3 in Anatomy & Physiology with a qualification in body massage. Although you will be learning a great new skill of immense value, the workshops always turn out to be plenty of fun and an enjoyable experience for all attendees. Qualified therapists can apply the Dorn Method after this Workshop training seminar and also obtain relevant insurance from at least Balens, IPTI and F.H.T. on production of the Dorn Method Workshop Certificate (the list of insurance companies covering Dorn in the UK is now growing). The workshops are held at DornHaus Natural Therapy Centre at the Stratford Garden Centre, which is a very short drive from Stratford town centre. More information can be found at the Dorn Haus website. There are plenty of reasonable B&B’s in Stratford upon Avon with several hotels including Premier Inn and Travelodge. Stratford is a great place to spend a weekend with lots to see and do, many students come a few days early to enjoy the sights and sounds! For further information please visit the following website. The workshops are held at the Diorama Arts Centre which is located in Central London only a short distance from Regents Park with easy access by train, tube and bus. The address is: Diorama Arts Centre, 201 Drummond Street, Regents Place, London, NW1 3FE. Their website for directions can be found here: Diorama Arts Centre. The most convenient way to book is to pay your £100 deposit by credit/debit card using PayPal by clicking on the Book Now buttons above, under each course date. After your booking has been confirmed, I will contact you by email to forward more information about the course. In the meantime, if you have any further questions, please just contact me for more information about learning the Dorn Method on the workshop. PLACES ARE OFTEN LIMITED SO PLEASE DON'T DELAY. I look forward to seeing you at the next workshop. More pictures and details of past workshops can be seen in the news section of this website. Thanks Brigitte, the workshop was everything I had hoped for - and more. Hi Brigitte, Many thanks for an excellent workshop (your first of many to come). It was without doubt the best start to our vast learning curve that we could have had. As for Thomas! What can only be described as awesome!!! Hope to see everybody soon. Hi Brigitte, hope you're well. I just wanted to thank you for a wonderful seminar. I had a great time and learnt a lot, of which I'm already putting into practice. I'm looking forward to the advanced seminar. by to take some photos! Hi Brigitte, Thanks for a great weekend and the chance to meet such nice like- minded people. Thought I would let you know that I have already given a treatment to two family and friends and am now awaiting their feed-back. Also the last 3 mornings since receiving treatments,for the first time in 3/4 years I have managed to get out of bed normally and not like a crippled old woman! hurrah for Dorn!! I look forward to getting more Dorn experience and meeting up with you soon. Hi Brigitte Thank you for all the data you have sent. You were right, it is extensive! I am looking forward to printing it all out! Many thanks again for such a wonderful and informative course. I feel it was a weekend well spent not only for your teachings but also the new friends I have made. I am sure we will all keep in touch. I have had 3 volunteers here at work today who want me to practice my new skills on them, with a possible first patient for a DORN treatment next week. I will let you know how it goes. I wish you great success Brigitte and I look forward to all of us meeting up again soon. Ann's Collar bone joint being corrected - whether she likes it or not! A few group photos of Workshop attendees proudly displaying their Dorn Certificates. As usual, these were great weekends with such wonderful people who all thoroughly enjoyed themselves!